E-transactions are not limited by national borders by nature. Their adequate legal treatment is critical to ensure that all the benefits associated with the use of electronic means are fully enjoyed. Electronic exchanges have recently further increased due to the mobility of devices, but this also created additional legal challenges. 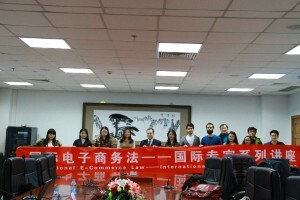 In order to understand the main issues and the policy and practical implications, learning international law and foreign laws involving e-commerce has become as important as study of the relevant national laws. The Joint Certificate Program (JCP) was jointly established by the United Nations Commission on International Trade Law Regional Centre for Asia and the Pacific (UNCITRAL RCAP) and Beijing Normal University (BNU) in October 2013. 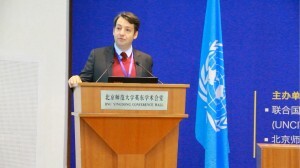 JCP with UNCITRAL Dr. Luca Castellani and BNU Prof. Dr. Hong Xue as Co-Directors, provides the unique opportunity to learn various legal issues in international electronic transactions, with special attention for international aspects and transnational legislation. JCP was born at the right timing. 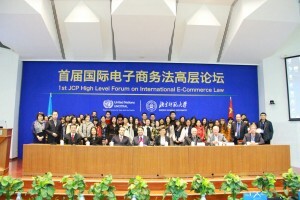 Internationally, JCP is a part of the UN legal technical assistance program to provide e-commerce law training to Judicial, Commerce and Customs Officials from the developing countries, e.g. Cambodia, Kazakhstan and Sri Lanka. 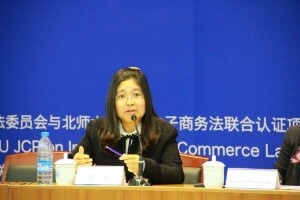 Nationally, JCP squarely fits the Chinese needs for high-level capacity building, research and international exchange on international e-commerce law, particularly when Alibaba and many other e-commerce enterprises were recently publicly listed overseas and Chinese E-Commerce Law is being drafted. 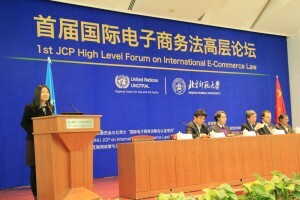 The first JCP High Level Forum provided a new rare opportunity for the Chinese community to directly interact with the international experts from UNCITRAL, UNESCAP, UNESCO, IDLO, etc. who were invited to provide their legal opinions and comments on Chinese E-Commerce Lawmaking to the Chinese Legislature. The BNU Newspaper published a comprehensive News Report on the Forum. Mr. Xinwang Shen, Alibaba Inc.